Jadeite (called Jedite in the English anime) is the first of the Shitennou to appear, and the lowest in rank. In her Materials Collection, Takeuchi describes him as being about 18 years old in appearance, making him the second-youngest, while in the live-action series he is the youngest. He is the head of the Dark Kingdom's Far-Eastern Division and is named after the mineral jadeite. In the manga, Jadeite's mission was to track down the Silver Crystal but eventually led to gathering life energy to awaken Queen Metaria. Jadeite had very little interaction with his fellow Shitennou in the manga and was only seen with Nephrite who would ridicule the first king when his grand schemes failed. Nevertheless, when Jadeite was killed at the hands of the newly awakened Sailor Mars (whom he expressed physical attraction to) Nephrite vowed to avenge his fallen comrade. When the power of the Silver Crystal was finally revealed Jadeite was briefly returned to life with his fellow Shitennou and pledged his loyalty to Prince Endymion, his former master, once again. Unfortunately he and the rest returned to their native crystal forms shortly afterward. Later in the manga series Jadeite and the other Shitennou would appear in visions to Endymion to counsel and advise him in times of trouble. In the anime, Jadeite's mission was essentially the same as in the manga though expanded to cover a number of new plots. He was subservient to Beryl to a fault and endured each successive punishment for his failures with the resolve to reform his tactics to better please the queen. He was also considerably more sexist against women in the anime than in the manga, often remarking how women and girls could not match his power nor comprehend his methods. However, this sexist attitude would only be toned down in the English dub, in favor of a rivalry between him and the Scouts instead. In the dubbed Episode 12, he even flirts with "Serena" where he had not done so in the original vesion. 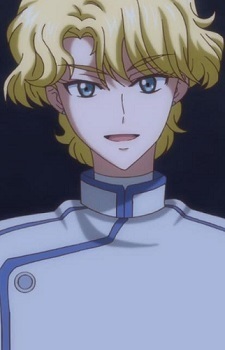 nevitably his failures led to the Queen's loss of faith in Jadeite and he was issued an ultimatum: destroy the Sailor Senshi or face the punishment of Eternal Sleep. Jadeite poured all his effort into the final assault, threatening the destruction of Tokyo should the Senshi not agree to his duel. In a final showdown Jadeite threw down Tuxedo Mask and very nearly succeeded in destroying the Senshi though in the end their teamwork and a well-placed curse from Rei rendered Jadeite the victim of his own trap. Upon returning to the Dark Kingdom with the news that he had learned the secret identities of the Senshi on his lips, Queen Beryl encased him in an impenetrable ice crystal and condemned him to his restless Eternal Sleep. He is not seen again, and is presumably still encased in crystal after the end of the story arc. Jadeite's powers were formidable and manifested themselves through illusions and telekenetic manipulation. Jadeite was able to control Sailor Moon's tiara and render it harmless. He also apparently loved conjuring new and exciting ways to traverse vast distances through teleportation. Are aliens really out there? When it comes to Bishoujo Senshi Sailor Moon Crystal, they’re not only here, they’re everywhere! It’s not just the evil aliens that we see the sailor squad fighting either; the girls themselves are also aliens, each from a different planet in the solar system.